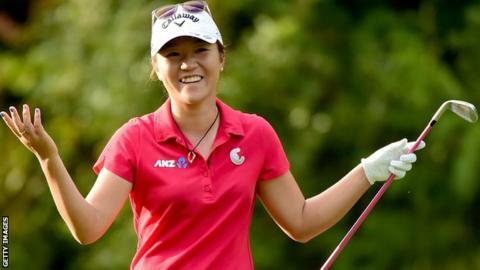 World number two Lydia Ko won the Canadian Women's Open after beating American Stacy Lewis in a play-off. New Zealander Ko, 18, previously won the tournament as an amateur in 2013 and 2012 and completed another win in Vancouver at the first play-off hole. A 12-under par total set up a third victory of the season and the eighth of her LPGA career. "It has been such an amazing week," said Ko, who had closed with a level-par 72. World number three Lewis, 30, fired a final-round 67 but missed a nine-foot par attempt before Ko made a three-foot putt to win their play-off. Defending champion Ryu So-yeon shot a final-round 64 and finished in a tie for third with fellow South Korean Kim Sei-young on 11 under, while England's Charley Hull shot a final-round 70 to finish tied for seventh on nine-under par.